After four years of debate, France has finally adopted a law on duty of care by multinational companies. This paves the way for similar laws in Belgium and Spain, although the project is stalled at European level. EURACTIV France reports. The legislative marathon of the multinationals’ duty of care bill came to an end Tuesday (21 February) after four readings in the French parliament. Under negotiation since almost the beginning of François Hollande’s mandate, the bill aims to strengthen the responsibility of parent companies for their subcontractors, particularly in the developing world. The bill was adopted by a large majority: of the 98 MPs present for the vote, 94 voted in favour. Most MPs outside the governing Socialist Party abstained, but despite official instructions to reject the bill, some Republican MPs voted for it. This bill was initially proposed as a response to the Rana Plaza drama in 2013, when a factory in Bangladesh collapsed killing 1,000 people. This event highlighted the responsibility of companies like Mango and Benetton in their dealings with subcontractors. A year after the Rana Plaza building collapse that killed 1,135 people in Bangladesh, the European Commission is mulling a new initiative to boost labour standards for global companies that supply Europe’s high streets, as a flagship for Europe’s Year of Development, which begins in 2015. In more tangible terms, the new law obliges French companies to adhere to a vigilance plan to prevent violations of human rights and environmental damage throughout their production chains. “That should allow us to avoid another Rana Plaza,” said Dominique Potier, a Socialist MP and rapporteur on the bill. But for Sandra Cossart, from the association Sherpa, the law “does not create a new regime of responsibility for companies because there is no obligation for results, just for diligence”. So French companies will not be held responsible for the failings of their subcontractors, as long as they have a due diligence plan in place. Companies can be sanctioned with fines of up to €30 million for not respecting the rules. But the original bill was softened during the long debate, with criminal prosecutions for company bosses among the measures removed from the final version. The list of companies affected by the measures was also cut down to include only those with at least 5,000 employees; a total of no more than 200 companies. 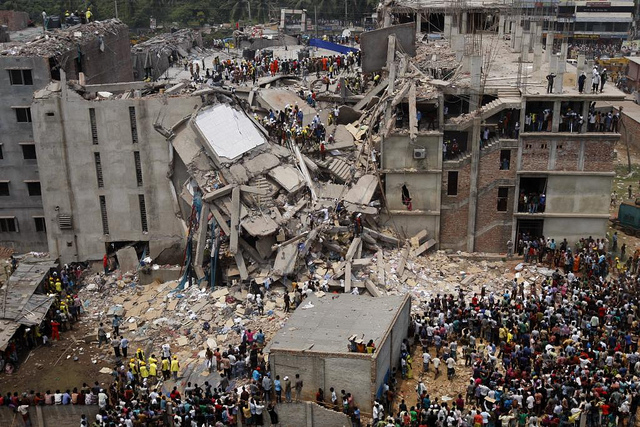 More than one thousand workers died in the Rana Plaza factory collapse. Responsible business initiatives have since emerged, but EU companies are still not obligated to prevent human rights abuses in their supply chain, write Paige Morrow and Jérôme Chaplier. While the left largely supported the bill, it was heavily criticised by the right. Opposition MPs attempted on several occasions to block the bill over concerns it would be economically harmful to European companies and their subcontractors in developing countries. Republican MP Patrick Hetzel sees the law as an attack on SMEs in developing countries. He said “it could have perverse effects on local businesses in developing countries by pushing multinational companies to cut down their list of subcontractors”, as well as forcing some to pull out of “high risk countries”. After Tuesday’s vote, several Republican MPs said they would take the issue to the Constitutional Court, attacking the notion of ‘responsibility’ as vicarious. For Economy Minister Michel Sapin, the economic relevance of the bill has been “exaggerated and sometimes falsified”. “Globalisation must be accompanied by increased responsibility from all actors. […] This duty of care will make us a model in this area,” he said. This first step by France should pave the way for the adoption of similar legislation in other European countries like Belgium and Spain. “Belgian MPs told us they wanted to do something similar, and next week we are meeting Spanish politicians who are also interested,” said Danielle Auroi, the president of the French parliament’s European Affairs Committee. But the mobilisation of a small number of countries has not been enough to push the issue on at European level. In May 2014, the Commission issued a press release on the responsible management of global supply chains and commercial practices in developing countries. But these measures remain non-binding for EU companies. After the Rana Plaza tragedy the executive said it would prepare legislation to protect the rights of workers in developing countries, particularly in the textiles sector. But the text has yet to materialise. “We are currently coming up with a working document that will include recommendations on how to improve and implement actions in developing countries. This working document will be published in May,” a spokesperson told euractiv.fr. The collapse of a textiles factory in Bangladesh in April 2013 was the third deadly accident in six months and raised questions about the safety of workers and working conditions in the poor countries of South Asia, where textiles represent 80% of exports.